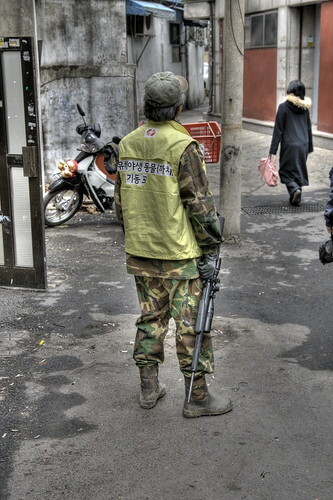 On my way home this afternoon, trotting through the back streets of Itaewon I was rather surprised to see a man with a rifle. Nobody was screaming or cowering in fear, so I decided not to run, but to ask him what he was doing. Turns out he's a magpie hunter. 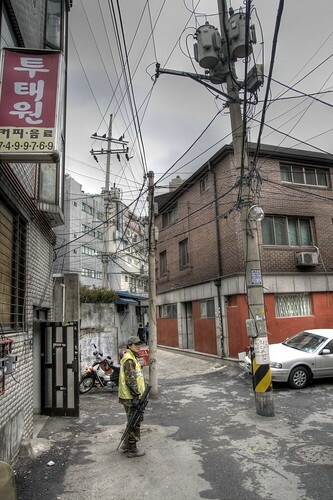 The dastardly magpies of Itaewon are nesting in the pylons and so must be shot. The writing on his jacket is 유해 야생 동물 (까치) 기동 포획 반 (Which I think means "harmful wild animal (magpie) rapid capture group"). I saw him take one down, but when I ventured outside later on there were still plenty of magpies and no sign of the hunter. I wonder if I'll see him and his rifle in these parts again. That first photograph is wonderful. The gent looks perfectly comfortable, doesn't he?! 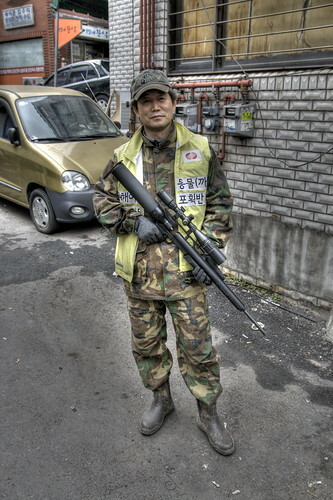 It's so weird to see a rifle in Korea! He certainly seemed to be enjoying himself. It was only a gas- powered rifle, but nobody in the area seemed bothered by it, curious bystanders. You know they serve magpie as "chicken" in chicken cheese ramyon? what a slum. That place looks 4th world.